Cisco Meraki have introduced some exciting new products into their range. Firstly there are the new MX250 and MX450 Security Appliances. These both offer 2 x 10G SFP+ WAN ports and 8 x Gigabit RJ45, 8 x Gigabit SFP and 8 x 10G SFP+ LAN ports. The firewall throughput of the MX250 is 4Gbps, VPN throughput is 1Gbps and the MX250 is recommended for up to 2000 clients. 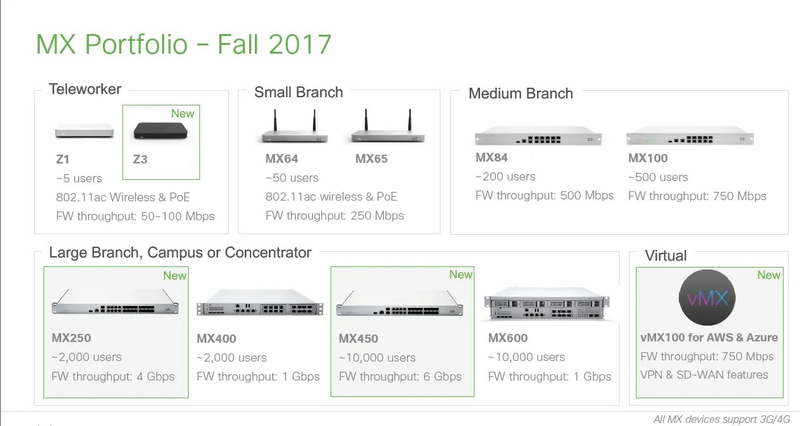 The firewall throughput of the MX450 is 6Gbps, VPN throughput is 2Gbps and the MX450 is recommended for up to 10,000 clients. Joining the existing Z1 is the new Z3 Teleworker Gateway. This has some important enhancements to keep up with the faster networks encountered in the home or very small branch office. Although it is still targeted at up to 5 clients the firewall throughput is doubled to 100Mobs and the VPN throughput is increased to 50Mbps – 5 times that of the Z1. Wireless is upgraded to 802.11ac Wave 2 and one of the Gigabit LABN ports now offers PoE capabilities to run an IP Phone or camera. Finally an optional stand is available allowing the Z3 to stand vertically. A Virtual MX100 is now available in the Azure Marketplace offering similar capabilities to the AWS version; 750Mbps VPN throughput, full SD-WAN capabilities and you simply buy the MX100 license – no hardware cost. Several worthwhile enhancements have been made to Systems Manager. It is now possible to schedule when application and profile updates won’t be applied to certain devices such as Point of Sale terminals and students during class time. Only push OS updates after hours. Apple TV will be supported. Use Apple TV to build display content in stores, office buildings and classrooms. Wirelessly share iOS and macOS content to Apple TV with AirPlay. Cisco Security Connector is a new app that can be deployed on Systems Manager-supervised iOS devices allowing the enablement of multiple Cisco security entitlements in a single app. The new MS120-8 is an 8 port Gigabit compact switch with PoE (67W LP model) and PoE+ (124W FP model) options. Uplinking is by 2 x Gigabit SPF ports and virtual stacking is available. The new MS120 is a 24 or 48 ports Gigabit small branch or SOHO switch with PoE (370W P & LP models) and PoE+ (740W FP models) options. Uplinking is by 4 x Gigabit SFP ports and virtual stacking is available. The new MS210 is a 24 or 48 ports Gigabit branch and small campus switch with PoE (370W P & LP models) and PoE+ (740W FP models) options. Uplinking is by 4 x Gigabit SFP ports and virtual or physical stacking is available. Static Layer 3 routing is also available. A redundant power supply is an option.